Can Paul Pierce get Jayson Tatum out of his sophomore slump? It's not that Jayson Tatum is having a bad season. But many of us felt, after seeing his last-season performance, that he would have broken out this year more than he has. His field goal percentage dropped from 47.5% last season to 45.2% this year, and his 3-point percentage fell from 43.4% to 36.9%. Jayson is taking almost three more shots per game this year - scoring two more points per game (15.9 PPG) - but his efficiency has dropped. The Captain thinks that Tatum driving to the hoop more often would improve his game and his production. Pierce knows whet he is talking about. He was relentless about driving to the hoop for a score or a foul. According to the Boston Herald's Steve Bulpett, Paul holds the franchise record for free throws made and attempted. (Paul) Pierce wants to see Tatum drive more, believing the difference in his bottom line would be significant. ...Pierce had a lot of driving and low post trips in his bag — enough to make him the franchise leader in career free throws made and attempted, as well as the single season record holder in both categories. I haven’t talked to Danny about it yet,” Pierce said. “Me and Kevin (Garnett) talked about it when he went down there, but that’s something I would love to do. I probably will talk to Danny. Pierce's thought is that there is too much talent on this Celtics squad for Jayson to fully blossom, and he may be correct. With Kyrie Irving and Gordon Hayward back in action this season, much of the focus is off the sophomore - thus what appears to be a minor slump. 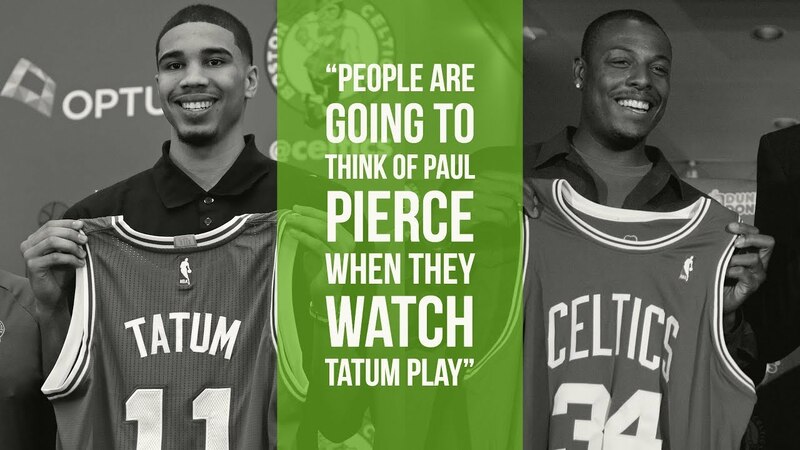 I love the idea of Paul working with Tatum, and also the possibility that old friend, Kevin Garnett, may just drop by periodically. This squad needs something to lift it up, and Paul Pierce may just be part of the solution.